Abydos (known as Abdju to the ancient Egyptians) is located on the edge of the desert on the west bank of the Nile River, about 165 km north of Luxor. Along with Dendera further south on the Nile, is Abydos a popular day trip from Luxor. 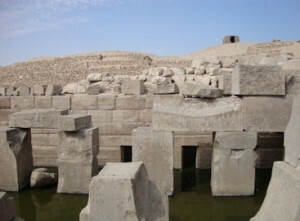 Abydos has a very ancient history as a settlement, cult centre, pilgrimage site and necropolis. 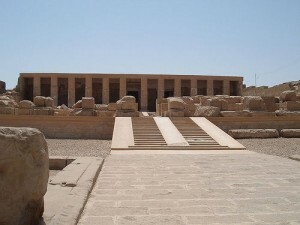 The sacred city of Abydos was the site of many ancient temples, including the royal necropolis at Umm el Qa’ab, where since prehistoric pharaohs were entombed. Abydos was significant in historical times as well as the main cult centre of Osiris, the god of the underworld. This makes Abydos one of the most important archaeological sites of Ancient Egypt, because it contains archaeological remains from all periods of ancient Egyptian history. Today Abydos is notable for the memorial temple of Seti 1, the Osireion and the Temple of Ramses 2. These sites however, are only three constructions in a vast complex of settlements, shrines, cenotaphs and tombs stretching for 8 km along the desert edge. The temple was begun early in the reign of Seti 1, who was the second ruler of the 19th Dynasty and completed by his son, Ramses 2. The Temple of Seti 1 is constructed of limestone on a low slope of the desert edge. It has an unusual L-shaped construction and multiple sanctuaries, but otherwise incorporates the elements common to Egyptian temples. The entrance is on the north side. The entire complex is surrounded by a mud brick enclosure wall with a brick pylon off centre on the west. The Temple of Seti 1 is notable for its fine reliefs, especially in the seven sanctuaries. The sanctuaries are dedicated to Seti 1, Ptah, Ra-Horakhty, Amun, Osiris, Isis and Horus. Each one is roofed with false vaults carved from rectangular slabs and end in false doors (except for the sanctuary of Osiris, which has a real door to his inner sanctuaries). Behind the seven sanctuaries are the inner sanctuaries of Osiris, with three side chapels dedicated to Isis, Seti and Horus respectively. The reliefs in these chapels retain much of their bright colours, but have been blackened by mould in the last decades. Not far from the sanctuary of Seti 1 is a portal that leads into the Gallery of Kings, named for the list of Seti’s predecessors carved into the right wall. This list is also known as the Abydos Kings List. It is a chronological list showing cartouches of most dynastic pharaohs from Narmer / Menes until Ramses 1, the father of Seti 1. Hatshepsut and Akhenaton (with his heirs) are omitted from the list on accordance with custom. Seti’s own name is listed as Menmare Osiris-Merneptah, instead of Menmare Seti- Merneptah in order to distance himself from Seth (also known as Seti), the enemy of Osiris. Directly behind the Temple of Seti 1 we find the underground complex of the Osireion, which is made of massive blocks. This wonderful building continuous to baffle Egyptologist, because there has been some disagreement as to the actual age of this structure even since the first discovery in 1902. The Osireion is a building unlike most others in Egypt. The architecture most closely resembles that of another anomalous structure, the Valley Temple in front of the Sphinx and near the Great Pyramids. One of the first theories introduced about the Osireion was that it was the tomb of the famous antediluvian King Osiris. This seemed to make logical sense since the Osireion had been discovered in Abydos, which for thousands of years had been worshipped as the location of the tomb of Osiris, even though no definitive tomb of the legendary king had ever been found there. Another anomaly of the Osireion that may support the temple’s antiquity, as well as its intimate connection to Osiris, is the Flower of Life. This symbol is engraved upon one of its massive pillars and not found anywhere else in Egypt. This motif appears to be the only symbol adorning the megalithic temple, thus apparently identifying its usage. Since the Flower of Life is made of innumerable ‘Vesica Pisces’, which give the appearance of many eyes, the symbol seems to indicate that the Osireion was dedicated to Osiris, whose name means ‘many-eyed’ or the ‘strength of the eye’. Therefore, the Flower of Life symbol could suggest that the Osireion was indeed Osiris’ tomb or a temple used for rituals associated with his cult of resurrection. Conventional archaeologists however, credit the Osireion to pharaoh Seti 1. The reason for attributing the Osireion to Seti 1 is that his name and the name of his son are inscribed in many places, but of course an inscription can be added later, even much later. Maybe we’ll never know when the Osireion was built. Fact is that this place is indeed mysterious and enigmatic. Perhaps it will transport you back to an ancient era, the age of King Osiris. The ancient entrance of the Osireion was to the northwest and outside the enclosure wall. In one of the chambers there is a wall paining of the Book of Caverns and the Book of Gates. Each of these books describes the sun’s god nightly journey through the underworld. In one of the two transverse halls the ceiling presents two images of the sky goddess Nut, stretched along the central axis with arms and legs bent down to the ground, framing two compositions. One of these, the Book of Nut features Nut’s father Shu, the god of the dry, holding his daughter up and away from her brother Geb, god of the earth. On the opposite half of the ceiling the companion image of the sky goddess frames the Book of the Night. This describes another version of the sun god’s nightly journey, this time through the body of Nut, goddess of the sky, who swallows him at sunset and gives birth to him at dawn. This part of the complex is usually not accessible due to the height of the water in the central hall. The central island surrounded by water in the pillared hall has been interpreted to represent the primal mound that arose from the waters of Chaos at the dawn of Creation. About half a km to the north of the Seti 1 complex are the remains of the limestone Temple of Ramses 2. This temple was considerably smaller in scale, but with its pink and black granite door frames, sandstone pillars and a sanctuary of alabaster it certainly must have been a very beautiful one. It has a typical New Kingdom plan with two pylons on its long axis, each followed by an open court, and leading to a pillared portico followed by two hypostyle halls, and the sanctuary at the rear. Little now remains of the temple. However, many brightly coloured reliefs are still to be seen on the lower parts of the walls. Around the inside of the court are scenes depicting offering processions while the outer walls depicts the Battle of Kadesh. Abydos has been used as a burial and sacred site since pre-dynastic history. The royal necropolis was placed about 1,5 km into the great desert plain, at a place nowadays known as Umm el Qa’ab, the Mother of Pots, because of the shards remaining from all of the devotional objects left by religious pilgrims. Four separate areas can be identified. In the most southerly part of the necropolis are the tombs of the New Kingdom. To the north of this is a hill containing burials of the Late Old Kingdom. Still farther north are the tombs of the Middle Kingdom, many of them in the form of small brick pyramids. Here are burials of other periods too, particularly the 18th – 20th Dynasties and the Late Dynastic Period. Finally in the west are the royal tombs of the earliest dynasties. Also a fleet of 14 mud brick boat graves were found at Abydos. These date from the Old Kingdom and as such are the earliest boat burials discovered in Upper Egypt. One grave has been completely excavated. It included a wooden boat made of local tamarisk, lashed together and covered with white plaster and painted dark yellow. Also identified at Abydos are donkey burials, evidence of the importance of these animals to pre-dynastic cultures.